Houston’s Famous Grizzly spent a considerable amount of his life living in the geographical area known as “Hungry Hill”. This area is located a few miles West of Houston and has been home to many grizzly bears. This bear is known as one of the “Phantom Bears” that had been killing livestock in that particular area. He is approximately around 18 - 22 years old, weighs 975 pounds and when standing erect he is 11 feet tall. 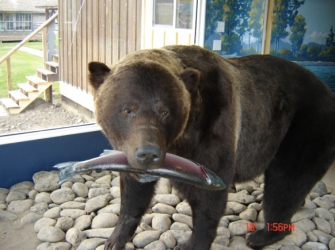 This bear is on display at the Houston & District Chamber of Commerce and Visitor Centre next to the World’s Largest Fly Rod.